Also to have a laser keyboard, holographic display and a flux capacitor (to enable time travel) – all the rumours in one handy infographic. The latest phone sales stats from IDC (and published by Engadget) show that smartphones are now out-stripping featurephones. The biggest winner is Samsung who sold 4 million more units in the last quarter than the previous year. 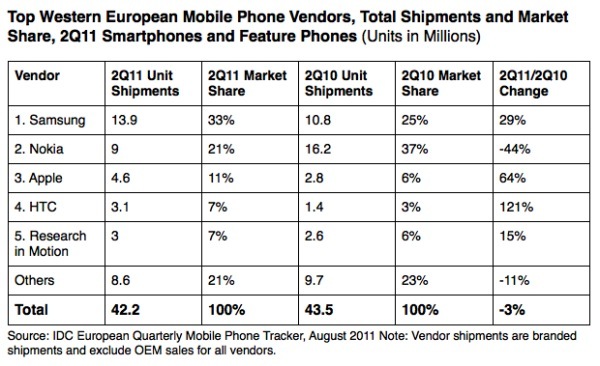 Apple also saw an increase in their market share from 6 to 11%. This seems to largely be at the expense of Nokia who saw their sales drop by a whopping 44%. BlackBerry remained steady with their sales.